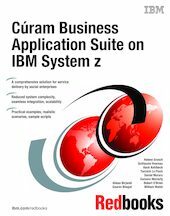 In this IBM® Redbooks® publication, we demonstrate how the Cúram Business Application Suite™ and IBM System z® together provide a complete solution for improving the efficiency and effectiveness of service delivery for social enterprises around the world. We also describe how agencies are realizing tangible benefits from this comprehensive solution. The long-standing strategic and technical partnership between Cúram Software and IBM has benefited our joint customers in a number of ways. Ongoing collaboration implementing the Cúram Business Application Suite at customer sites has resulted in a number of successful project deliveries. The partnership has also meant extensive cooperation between Cúram Software and IBM in optimizing the Cúram Business Application Suite on IBM systems and middleware, validated through performance and sizing tests using realistic volumes of data and transaction rates. The purpose of this book is to educate technical staff and management who are responsible for implementing the Cúram Business Application Suite about the benefits of deploying and configuring the solution on IBM System z through realistic configurations and scenarios. In Part 1 we introduce and explain the mission and objectives of social enterprises, and how the Cúram Business Application Suite supports these objectives. In Part 2 we describe an implementation of the Cúram Business Application Suite on System z and demonstrate the benefits of this platform using practical examples and configurations. In Part 3 we provide appendixes containing sample scripts, security information, and troubleshooting solutions.